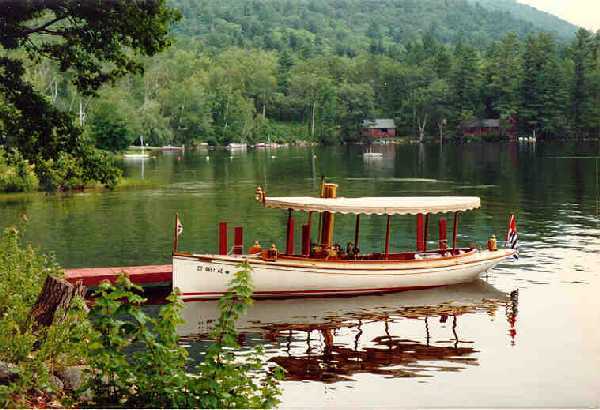 The hull was transferred to a boat trailer using a railroad crane (originally steam),and construction started in my 2 car garage, later moved to a separate building designed for the boat and trailer.The interior wood work is primarily Teak, which at that time was easily available and reasonably priced. By the time the hull was completed the boiler had arrived from Western Metal Products of California.The firebox is set up to burn hard coal, using wood to start up. Assembly of the engine and boiler into the hull took about 9 months. 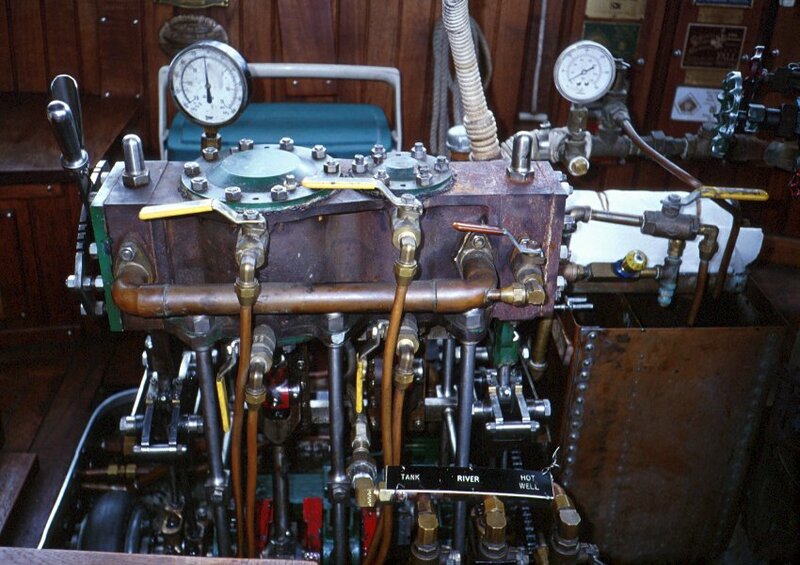 The initial feedwater pump and condensate pumps were the standard Stuart Turner design.The first trip took place on 3 May ,1985. 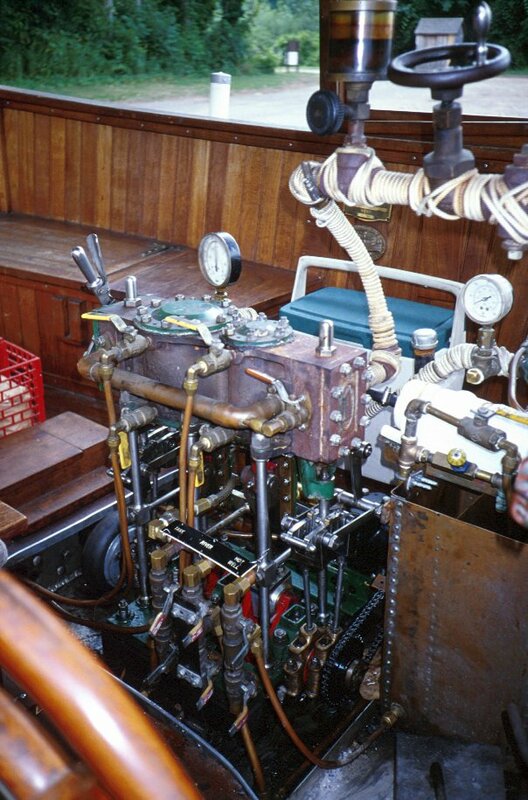 Early changes were the addition of a feedwater injector, and later replacing the ST pump with a duplex steam driven feedwater pump After about 500 hours of operation, and several main bearing replacements the ST engine was replaced with a similar sized, but better designed AVL engine from Yakima, Washington. This engine now(1997) has almost 200 hours of mostly trouble free operation, and uses roller bearings for the main bearings. A York Machine condensate pump was added at this time. 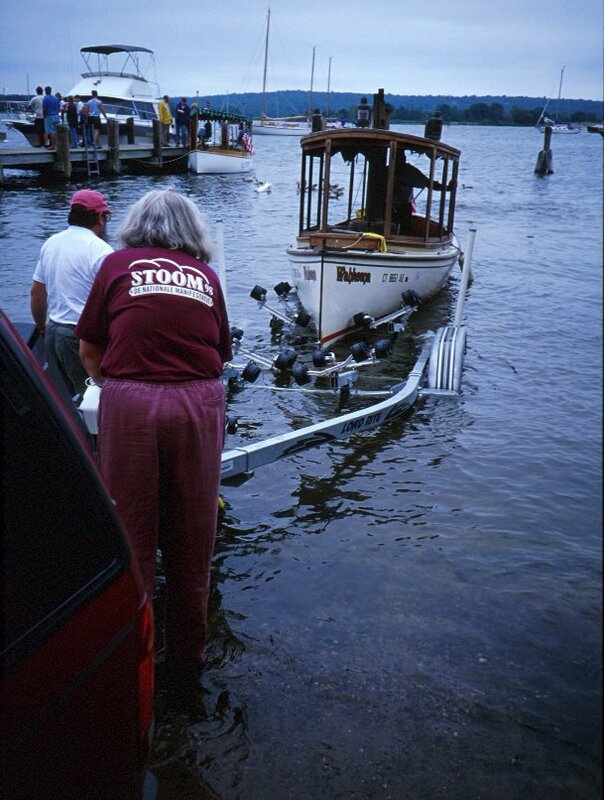 Although the boat makes occasional trips on the nearby Connecticut River and local lakes much of the steaming takes place at the annual week long meeting of the Great International Steamboat Regatta,which alternates between the canals of Ontario, Canada, and various canals and lakes of New York State. 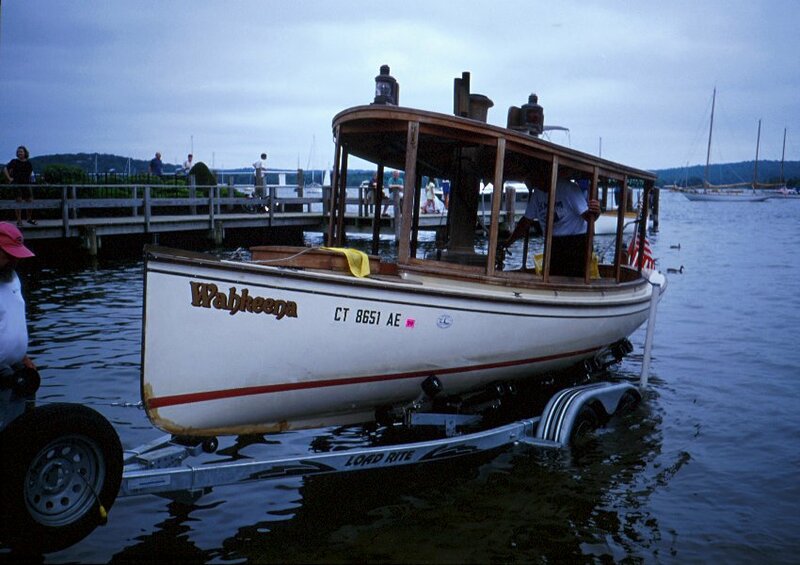 Another regular meet is at Lee's Mills on Lake Winnepesaukee in New Hampshire, which has about 40 steamboats attending each year. 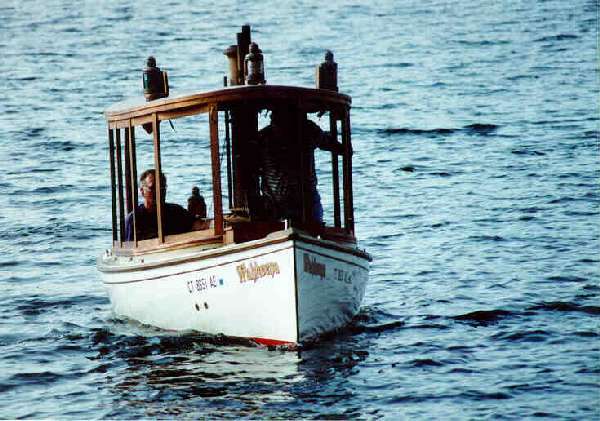 After 13 years in the water Wahkeena has made 212 trips covering over 3800 miles (6050 km. 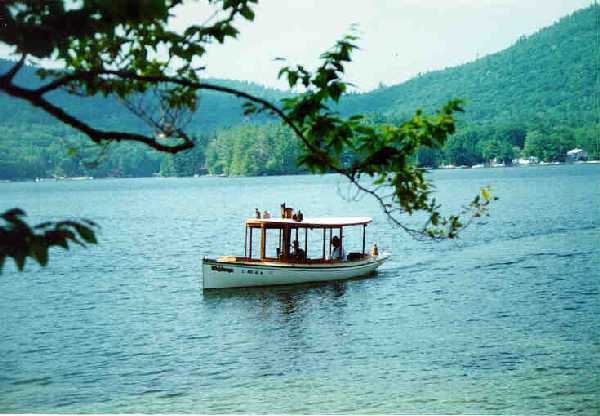 ).The longest one day trip was 46 miles (73 km. ),with the average trip being about 29 km. As I am now retired and spend much time traveling to visit steam ships and railroads,the annual milage has been dropping. 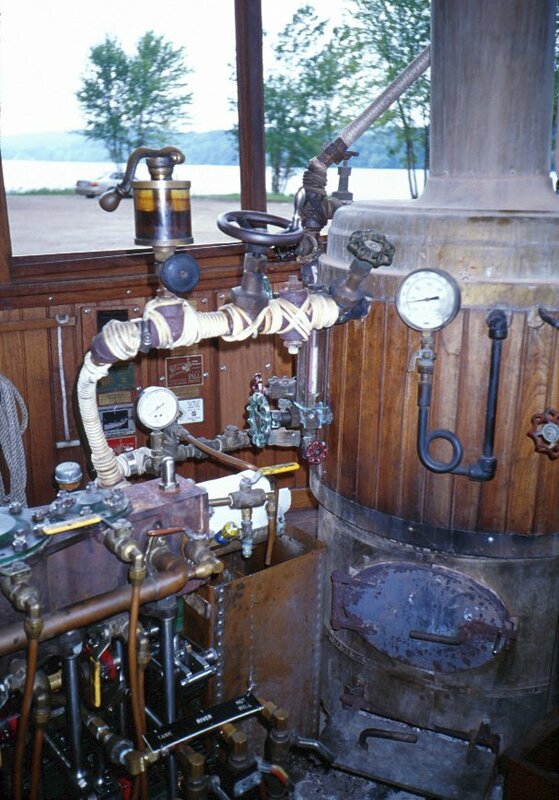 When not busy with or boat or traveling, I keep occupied by working as an engineer (driver) of a steam locomotive on the Valley Railroad tourist train, or a Diesel locomotive on the freight carrying Connecticut Central Railroad. 2"1/4 + 4"1/2 x 4" AVL, Condensing, York machine pump, Breisch duplex feed-water pump, Buffalo injector. Engine & pumps built by owner. Western Metal Products, VFT, 40 sq. ft. heating surface, 109 - 3/4" pipe tubes, 20" shell diameter, dry fire-box, 135 psi, ASME "S" stamp, Connecticut license. 20 x 30" three-blade, Elliot Bay prop, 1"1/4 bronze shaft, 6,5 kn at 325 r.p.m. 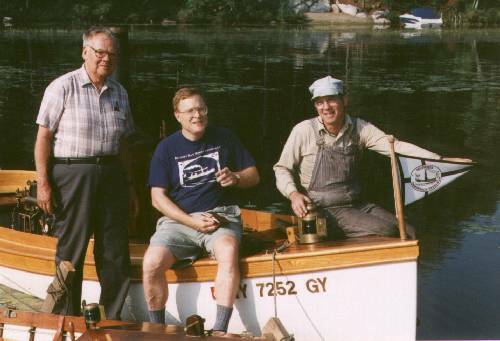 George Reitze, Pat Spurlock (wearing the Elliott Bay Steam Launch Co. T-Shirt) and Carl Kriegescotte.